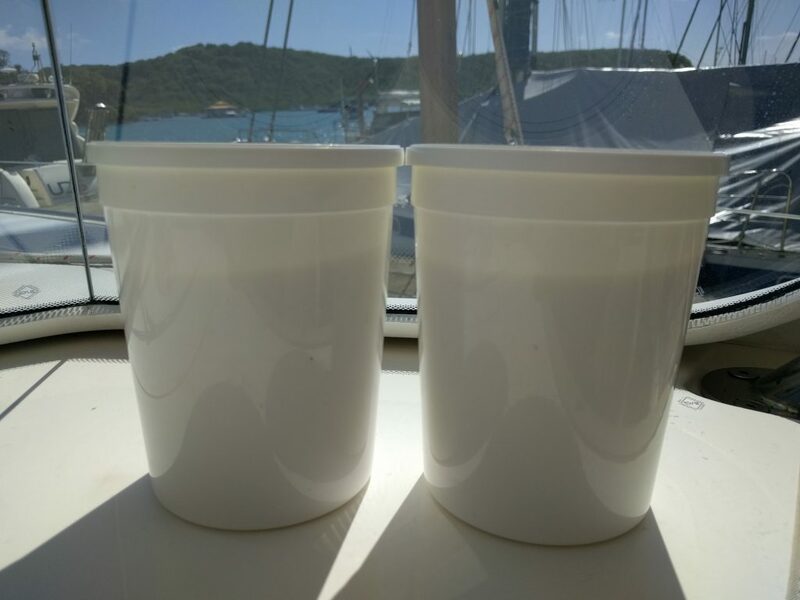 It’s hard to find unflavored, unsweetened yogurt on Grenada. Plain yogurt is such a useful staple; we use it to make for a savory sauce to cool and complement spicy food by adding mint, garlic, coriander or cumin to the yogurt. It’s also perfect for making coffee-flavored yogurt, which is virtually impossible to find in remote sailing stopovers. I make it by adding instant espresso powder and vanilla-flavored natural stevia instead of sugar. At home in the USA I use an electric machine and yogurt making is effortless. I was curious to see if a low-tech approach could work here where it’s so hot outside. Yogurt making requires even, sustained heat for at least 6 hours. 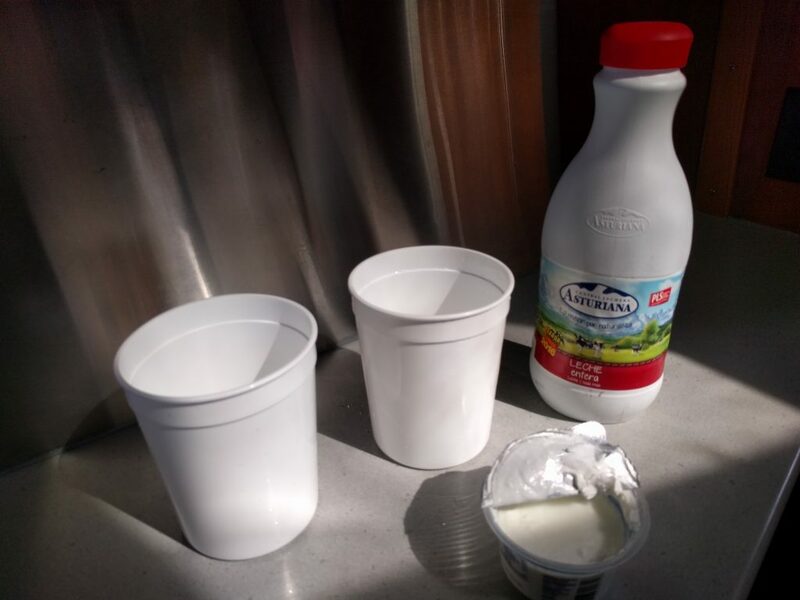 My yogurt making was up against all the “don’ts.” I used UHT milk – all that was available. I didn’t have any yogurt culture starter or powdered milk to add. And the one container (half as much as I needed) was so old it was marked down to a reduced price in the grocery store. I also didn’t have an electric machine or even a thermometer to be sure I was keeping the yogurt at the correct temperature. All I did was combine milk with yogurt and set it in a sunny, protected spot, which on Golden Glow is inside our windshield above our helm in the front of our cockpit. Then I went about my day and forgot about it until I got home from dinner 10-12 hours later. To my surprise and delight, the result was wonderfully creamy, delicious yogurt, with very little whey. 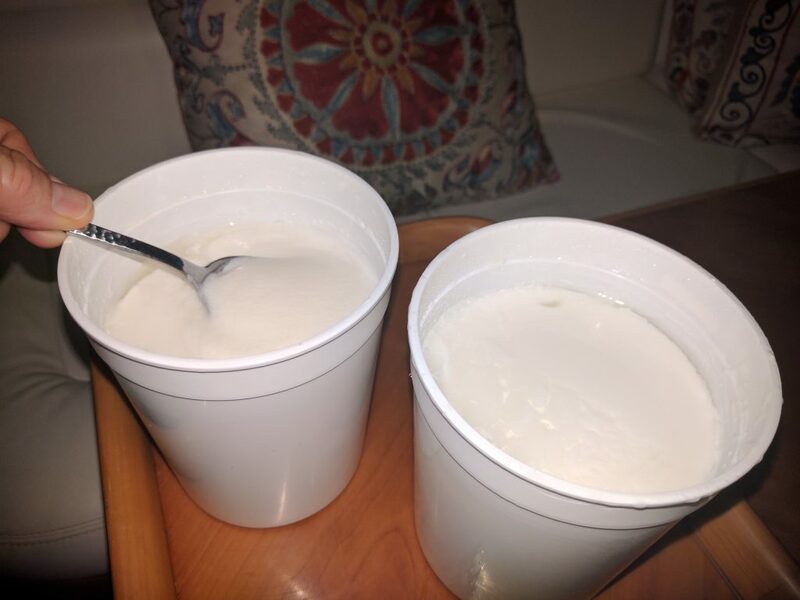 Powdered milk: It makes the yogurt thicken faster and better and I think makes the final product even better tasting.